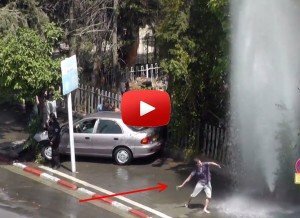 This guy improvised a beautiful street dance under a broken fire hydrant. It was authentic and real, believe me, I actually know the guy who filmed it. Wow! The photographer of this video is Ilyan Marshak and he posted the dance to his Facebook page. He is a political activist in Tel Aviv, where the dance was performed and filmed. It was real street dance, 100% authentic with no preparations. UPDATE: We Found the Dancer! Or to be more accurate, he found us. We’re excited and happy to update that the dancer approached us and gave his name, Yankalle Filtser and even his Facebook profile. Turns out that his story is even more interesting, with background as an ultra Orthodox and present as a professional dancer. Happy to give the credit to this brilliant dancer! This post with the Street dance under a broken fire hydrant video and the photos from it were edited especially for Briff.me. Hope you like it as well. If you wish to copy and share this, please be sure to give full credit and a link back. Thanks! If you like dancing, don’t miss this brilliant video for the World’s youngest choreographer, where a baby leads a trio of professional dancers. In case this post got you a an overload of street dancing and you need a real laugh, check out this hilarious video of a BBC reporter who gets high on TV. Very funny! Here at Briff.me, knowing that our precious time together on Earth is waaay too short for a long feed, we bring you the best of the best, like this special briff about the video of the street dance under the water. If you want to get more posts like this, click like on the Briff.me Facebook page.